Mrauk U (Burmese: မြောက်‌ဦးမြို့; MLCTS: mrauk u: mrui., Burmese pronunciation: [mjaʊʔ ú mjo̰]; formerly known as Mrohaung) is an archaeologically important town in northern Rakhine State, Myanmar. It is also the capital of Mrauk-U Township, a sub region of the Mrauk-U District. From 1430 until 1785, it was the capital of the Mrauk U Kingdom, the most important and powerful Rakhine (Arakanese) kingdom. Mrauk U lies roughly 11 kilometres (6.8 mi) east of the Kaladan River on the banks of its minor tributaries. 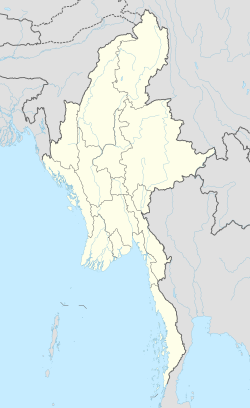 The town is located on a small outcrop of the Rakhine Yoma on the eastern side of the Kaladan's alluvial plain. Thus, the surrounding countryside is hilly yet also contains a great deal of marshes, mangroves and lakes. Mrauk U, like much of Rakhine State, is situated in a coastal tropical monsoon rainforest climate region. The town receives over 1,200 millimetres (47 in) of rain a year from the Southwestern Monsoon, making it one of the wettest regions in Myanmar. The Monsoon season usually begins in late May and ends by mid October. Although located in a tropical region, Mrauk U enjoys lower temperatures when the Northeastern Monsoon falls. From mid October to mid March during the Cool Season, temperatures can drop to 13 °C (55 °F). This season coincides with the tourist season for Myanmar. The rainfall on 19 July 2011 was nearly 24 centimetres (9.4 in), the highest for 33 years. There was flood because of continuous heavy rains in July 2011. Some Rakhine scholars state that the name Mrauk U means 'The First Accomplishment' in archaic Arakanese. This is based on the story of the Arakanese being able to crush an invasion by the Pyu in the mid 10th Century by a Mro prince, Pai Phru. The town is said to be located roughly near the region where the Pyu invaders were decimated. The prince went on to claim the throne of Wethali from his uncle who had murdered the prince's father due to a love scandal. The battle was seen as the first accomplishment of the prince, and thus, the name 'First Accomplishment' came to be associated with the place. A dismissed myth was that in the region where Mrauk U was to be constructed, lived a lonely female monkey. She met a peacock and the two later cohabited. The female monkey conceived with the peacock, and it laid an egg. A human son was born from the egg and he grew up to become a mighty prince. The prince later built a city near the jungle, and in respect of his birth story, the city was called Myauk-U meaning ‘Monkey’s Egg’. In 1433, King Min Saw Mon established Mrauk U as the capital of the last unified Arakanese Kingdom. The city eventually reached a size of 160,000 in the early seventeenth century. Mrauk U served as the capital of the Mrauk U kingdom and its 49 kings till the conquest of the kingdom by the Burmese Konbaung Dynasty in 1784. During British colonial rule, Mrauk U was known as Myohaung. On 16 January 2018, Rakhine protesters rioted near a government building in Mrauk U after a ban was issued by local authorities on an event that commemorated the anniversary of the Kingdom of Mrauk U's dissolution. In response to protesters attempting to seize the government building, police fired live ammunition into the crowd, killing seven and wounding twelve. Due to its proximity to the Bay of Bengal, Mrauk U developed into an important regional trade hub, acting as both a back door to the Burmese hinterland and also as an important port along the eastern shore of the Bay of Bengal. It became a transit point for goods such as rice, ivory, elephants, tree sap and deer hide from Ava in Myanmar, and of cotton, slaves, horses, cowrie, spices and textiles from Bengal, India, Persia and Arabia. Alongside Pegu and later Syriam, it was one of the most important ports in Myanmar up until the eighteenth century. The city also traded with non-Asian powers such as Portugal and then the Dutch East India Company of the Netherlands. The Dutch East India Company (VOC) established trading relations with the Arakanese in 1608 after the Portuguese fell in favour due to the lack of loyalty of Portuguese mercenaries, such as Filipe de Brito e Nicote in the service of the Arakanese king. The VOC established a permanent factory in Mrauk U in 1635, and operated in Arakan till 1665. At its zenith, Mrauk U was the centre of a kingdom which stretched from the shores of the Ganges river to the western reaches of the Ayeyarwaddy River. According to popular Arakanese legend, there were 12 'cities of the Ganges' which constitute roughly half of modern-day Bangladesh which were governed by Mrauk U, including Dhaka and Chittagong. During that period, its kings minted coins inscribed in Arakanese, Kufic and Bengali. Much of Mrauk U's historical description is drawn from the writings of Friar Sebastian Manrique, a Portuguese Augustinian monk who resided in Mrauk U from 1630 to 1635. As Mrauk U and her kingdom prospered, the kings, ministers and peasants built many pagodas and temples around the town to reflect their faith. Thus, Mrauk U houses a rich collection of temples and pagodas second only to the Central Burmese town of Bagan, in Myanmar. Most of Mrauk U's temples were constructed of hewn stone bricks, unlike the mud and clay bricks of Bagan. In 2017, an international commission urged Myanmar to nominate Mrauk U for UNESCO World Heritage Site status. The proposal is backed by Kofi Annan and archaeologists are now cataloguing and protecting the city's many sites in preparation for nomination. The following are some of the famous and noteworthy religious buildings in and around the town. The area around Mrauk U ranks second in the production of rice in Myanmar, after the Irrawaddy Delta. Today, Mrauk U is a major archaeological and tourist destination. The main attractions are the temples and ruins around the town. The remains of the main palace roughly form the centre of the town. The most popular mode for tourists to travel to Mrauk U is to take a domestic flight from Yangon to Sittwe and board a boat from Sittwe against the Kaladan River. The hotels in Mrauk U also arrange private boat services to and from Sittwe. Mrauk U houses a growing tourist industry, as it has only recently become a reachable tourist destination. Although a tourist destination, most of Mrauk U has very basic infrastructure. It has a Township hospital, a Basic Education High School and a market. Like much of Rakhine state and the whole of Myanmar, Mrauk U has 24-hour electricity. ^ "Mrauk-U (District, Myanmar) - Population Statistics and Location in Maps and Charts". Citypopulation.de. Retrieved 19 January 2017. ^ "Western Myanmar" (PDF). Medialonelyplanet.com. Retrieved 20 April 2019. ^ "Journeys Myanmar | Rain fall". Journeysmyanmar.com. ^ "Journeys Myanmar | Temperature". Journeysmyanmar.com. ^ "Mrauk U Travel - Rakhine (Arakan)". Gandawunshwebagan.com. Retrieved 20 April 2019. ^ Aung Khine, Min (4 April 2018). "Rakhine Field Investigation Delayed Months after Deadly Mrauk-U Incident". The Irrawaddy. Retrieved 6 April 2018. ^ Betty Han, Naw. "Former administrative officer of troubled Mrauk-U killed". The Myanmar Times. Retrieved 6 April 2018. ^ Thar, Chan (24 January 2018). "Rakhines seek impartial probe of Mrauk-U riot". The Myanmar Times. Retrieved 6 April 2018. ^ "7 ethnic Rakhine killed as Myanmar police open fire at riot: Official". The Straits Times. 17 January 2018. Retrieved 7 April 2018. ^ "CHAPTER EIGHT : TRADE AND TAXATION" (PDF). Openaccess.leidenuniv.nl. Retrieved 20 April 2019. ^ Hattem, Julian (11 June 2017). "With a forgotten temple city, Myanmar hopes to strike tourism gold". The Observer. London. Retrieved 14 June 2017. Wikimedia Commons has media related to Mrauk U.